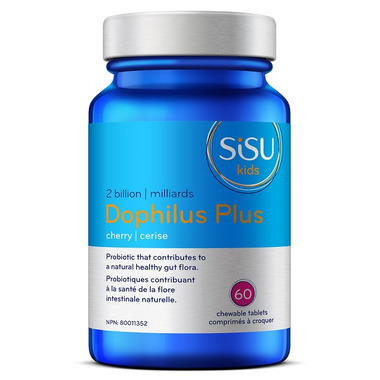 SISU Kids’ Dophilus Plus Chewable probiotic that contributes to a natural healthy gut flora. Non-Medicinal: sorbitol, fructose, microcrystalline cellulose, calcium silicate, citric acid, stearic acid, magnesium stearate (vegetable), natural cherry flavour, cherry juice concentrate, ascorbic acid, potato starch. Dosage: (Child 5+) Chew 1 tablet 1-3 times daily or as directed by a health care practitioner. Really happy with these! Great product and my son likes them. I really love this product. I feel like itâ€™s a great bang for your buck and my kids all love them. Our picky toddler loves these! Seems to have a positive affect of her immune system! Last bottle had a few broken tablets at the bottom which I had to discard (these aren't cheap) BUT overall still great probiotic. My daughter loves these chewable tablets--they are tasty and dissolve quickly no complaints from her. I make an effort to specifically purchase this brand once we run out. i wish they were available in the States. Taste delicious/tho sweeter than Iâ€™d prefer for my toddler. Toddler LOVES taking these probiotics! She always takes this one first! Perfect size, great ingredients!! She is picky so SISU is a winner in our house! These are the only probiotics my kids (age 6 and 9) like enough to actually remember to take daily. Daughter gobbles these done and they seem to help settle tummy. Super sweet though, of course. My taste & texture sensitive children absolutely love this product. I'm glad because it's made a huge difference in their health care & maintenance. I would highly recommend this product. I've tried a ton of different probiotics for my daughter and these are the ONLY ones that she loves. She actually asks for more! Just wish they would come in 5 billion doses since she has to take a higher amount due to a chronic illness. Great way to get some healthy and needed probiotics into my 3 year old. He loves the taste and begs for more. Will keep buying. Our 2 children trememdously enjoyed the taste of this brand. Other brands that I have tried they have refused them because of their taste & texture sensitive issuses. The taste of this brand is just the correct level for them to tolerate pleasingly. Better tasting then some but my kids aren't huge fans when it comes to taking this. My kids enjoy taking these and have never complained about the taste. I like that the bacterial level is so high, a lot of other children probiotics have significantly less. Easy to give to my toddlers, they like the taste and take it no problem. Saves mixing a powder into a drink and it clumping or not fully taken. This is easy, mess free. love it. My 3 kids love these - great taste and easy to chew. This is a high-quality brand - we use several of Sisu's products regularly in our house. It's not easy to find this brand of chewables in stores, so thanks Well.ca for making it so easily available! Great tasting product, easy to chew, easy on the stomach...my son enjoys taking it. Great product! I use them in cold and flu season to help the kiddies immune systems. They love the taste, seem easy to chew and they're always asking for more!!! Great vitamin, my son absolutely loves them! Have been using these all winter and the kids have definitely been feeling ill less. Also found it helped greatly With our middle childs constipation issues. My kids both like them and Sisu was a store brand my naturopath recommended as an alternative to the products she sold in the clinic. Finding acidopholous/probiotics in a form that kids manage is not easy. However, I was thrilled to discover the Sisu Dophilus Plus - the kids love chewing these tablets and don't mind the taste. I will definitely order more. my kids love this product, we call it a cherry vitamin. They like it and it seems to work well, they have had less colds and flu's this season! Great product, good flavour. My boys always enjoy getting these!